Truck driver Jack Burton arrives in Chinatown, San Francisco, and goes to the airport with his Chinese friend Wang Chi to welcome his green-eyed fiancée Miao Yin, who is arriving from China. She is kidnapped upon arrival by a Chinese street gang, leaving Jack and Wang to chase after the group. They soon learn that the powerful evil sorcerer, David Lo Pan, who was cursed more than two thousand years ago to exist without a physical body, needs to marry a woman with green eyes to retrieve a physical body and Miao is his chosen bride. Jack and Wang team up with a lawyer, Gracie Law, a bus driver, a sorcerer apprentice, Egg Shen, and their friends to embark on a great adventure in the underground of Chinatown, where they face a world of magicians, magic, monsters and martial arts fighters. We know what you’re thinking. What the heck?! Yes, it’s that crazy and that fun! 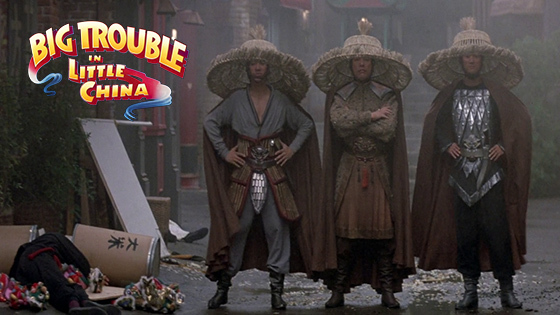 Big Trouble In Little China is one our top 10 all time favorites so we must go all out! For the ultimate movie experience, we will be giving out FREE Fortune cookies, FREE Egg Rolls From Franklin’s Ching Asian Bistro and we have LIVE martial arts on stage 20 minutes before the film by YONG IN MARTIAL ARTS ACADEMY.